For this week’s iDevBlogADay post, I’m going to do something a little different. Ok, it’s actually a lot different. Instead of talking about one of my own games, I’m going to talk about someone else’s game. I’ve been exchanging emails over the last couple weeks with Parker, the developer of an iPhone game called MicroSquares. He originally emailed me to ask some questions about what he could do to improve the popularity of his game, and wondered if I had any tips to help bring his game to the next level. After looking at his game, I realized that it had potential, but there were definitely some things that could use improvement. In the same timeframe I also had some similar conversations with other developers, and I realized that it would be great to make my suggestions for MicroSquares public, so that other developers could adapt them, learn from them and discuss them. Parker hasn’t heard any of these suggestions yet, but he did give me permission to post this on my blog. I should point out that I’m definitely no expert at any of this stuff; these are just my opinions and sometimes they may be completely wrong. My marketing advice comes from my experience with Trainyard, my design and usability advice comes from my days as a Flash developer, and my gameplay advice comes from hundreds of hours playing iOS games and working on games of my own. This post will probably come across as a bit critical, but I’m just being honest about the things I think Parker will have to do to make MicroSquares succeed. There are plenty of great aspects to the game, but I’m intentionally focusing on the negative because that’s the stuff that needs improvement. He’s got the core of a good game here and it really does have potential, but there’s still some solid work ahead. 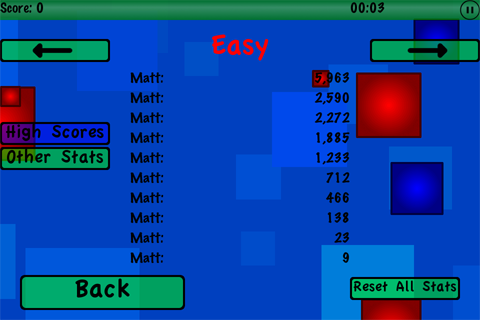 MicroSquares (iTunes link, 99c) is Parker’s first and only iPhone game. it works like this: you’re a square floating among other squares of varying sizes. You tilt to move, and grow if you eat smaller squares and die if you’re hit by bigger squares. The game is relatively simple and not entirely unique, but it’s fun. Some extra flavour is added via powerups that give you abilities such as “boost” and “magnetism”. I’d highly recommend downloading the game so you can “follow along at home”, it’s only 99c and I’m sure Parker would appreciate it! I’ll be providing screenshots here in the post so you can see what I’m talking about. I want to get the visuals out of the way, because I think that’s the area where the game needs the most tweaking. I heard this simple rule from someone who is a much better designer than me: “never use gradients with vector art”, and I think it’s true 99% of the time. There are definitely some high-end graphic artists who can pull it off, but for us mere mortals, it’s best to stay away from it. Gradients give vector art a cheesy “amateur Flash animation” vibe. If Parker replaces all the little gradients with flat colours I think it’ll give the whole thing a cleaner look. On the topic of the squares, the main square is just a green box. That’s OK, but this’d be a great place to create a character with some personality. It doesn’t have to be Pixar level stuff, just slap a couple eyeballs on him and see how he looks. I think this is the sort of game that could really benefit from having a unique lead character. It would give the game a bit more of a “fun” vibe, and it’d add the potential to create other characters, sequels, and a eventually a whole brand. It’d be cool if the powerups had icons on them instead of letters like “B” and “I”. Icons are a handy way to let users build up associations quickly, and I don’t think there would be any trouble coming up with icons for each power-up. The score seems to be the most important stat, so I feel like it should be given more emphasis, right now it’s tiny and tucked away in the top corner. For the menus, the font needs to change. Fonts should always match and support the subject matter, and I feel pretty strongly that marker/handwritten fonts should only be used for drawing apps and kids apps. The rest of the game has a fairly clean look, and the story is “sciency”, but the font *really* throws it all into confusion. A nice clean font would do wonders for the look of the entire UI. In my opinion, this is the number one problem with the overall look of the game right now. The music is *very* ambient and drone-y. At first I didn’t like it, but it started to grow on me. That being said, I still don’t think it suits the feel of the game. Music that’s upbeat and intense would make the game much more exciting. The sound effects also need some love. Some are just subtle but others are non existent. The current “eat” sound is just a click, but I think it should be an upward “growth”sound. The powerups hardly make any sound, and there isn’t even a sound for when you die. This could all be remedied with a few well-picked sound effects. Overall, I think the gameplay is great. It takes a little getting used to, but it’s fun to float around eating and avoiding. I like the on-screen “re-centering” button, but the tilt controls need to be a bit more sensitive. I found I was tilting my device too much while playing. Any time I’m giving advice on a tilt game, I always have to recommend Tilt to Live and Dark Nebula. These games aren’t just good examples, they’re the absolute pinnacle of tilt control on the iPhone. Parker should have a close look at both of these games to try to model his controls after them as closely as possible, as they really are perfect. I think Parker needs to decide whether he wants this game to be a “zen” game, or an intense “survive-at-all-costs” game. Right now I think it feels too mellow, and the pace just needs to be amped up a couple notches. 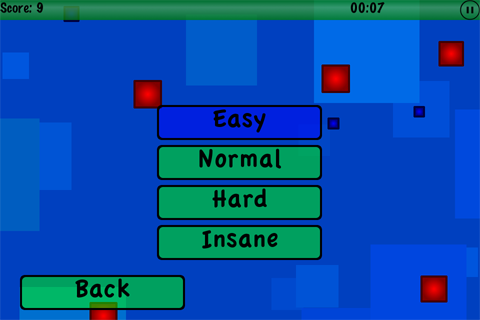 The game offers four difficulty modes: Easy, Normal, Hard and Insane. I think that’s too many. Most games like this only need a normal mode and an insane mode. The normal mode should start easy, but get hard pretty quickly. With too many difficulty options the player will just get confused about whether they’re playing in the right mode or the best mode for them, and they’ll be frustrated. As I was playing the current game, in the easier modes (all the way up to hard), the game was really too easy and it took a long, long time to finally die. I think it’d be best to keep the average “normal” game time in the 1-3 minute range, right now it feels like it’s way longer. At this point, MicroSquares only has local highscores. I think it’d be in Parker’s best interest to invest some time into learning and implementing OpenFeint or GameCenter. I think he’ll be surprised at just how easy it is. Online scoreboards could help a game like this to thrive and build a following. I know most of us developers hate the marketing side of things, but it’s a necessary evil. MicroSquares doesn’t have a YouTube trailer, but it needs one. A video is a fantastic way to show people what your game is all about, and you can reuse it all over place, especially on your promotion site instead of a wall-of-text explaining your game. Making a trailer really isn’t that hard to do, even if you’ve never done it before, and there are plenty of people out there who’ll be happy to point you in the right direction if you need help. The actual content in the app description for MicroSquares is great, but the order needs some tweaking. Users often only see the first two lines, so make sure you say the most important bits there! I like to follow this up those lines with a bunch of bullet points, and then finally the paragraph-heavy description stuff last. 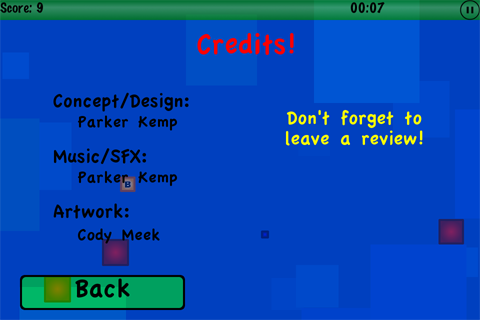 Just one small note for the credits screen. It’s great to ask for reviews, but Apple actually allows devs to link directly to the review page, so that’s something every single developer should utilize. Do everything you can to make it as easy as possible for users to review your game! I’m not a designer, so I can’t say exactly what needs to change here, but this icon definitely needs some work. This is one of those places where a professional designer can really come in handy. It seems to crash on the iPad. Not the end of the world since it’s not Universal, but still should be fixed. Currently the pause button gets shown when we’re already in the pause menu (and in every menu), which seems a little weird. I love how Parker is tracking tons of stats, but I think they need to be presented in a bit more of a fun way, right now it’s just a plain bulleted list. The red titles on the blue background in the menus clash heavily. I think if it was just blue and green with no red, that’d probably be best. The tutorial is basically fine, but it needs bigger “left”, “right”, and “exit” buttons. The powerups are decent, but I think they’d be way more fun if there were more visual effects, like particle trails and other cool stuff. That’s about it! I realize this post is strange compared to the sort of things I usually post, but I really wanted to try something different as an experiment. It was fun. I’m sure Parker will find this handy, and I hope that the rest of you will pick up some useful things too. PS: I’m going to check in on MicroSquares “after the transformation” to see how things have changed, watch for that post in a few months. UPDATE: I’ve heard from Parker that he got a lot out of this post, and he’s going to be working to implement most of the changes that were suggested. Stay tuned! This entry was posted in App Store, Game Design, iDevBlogADay, iOS Development. Bookmark the permalink. This was just the sort of thing I needed to read while I’m working on my game. 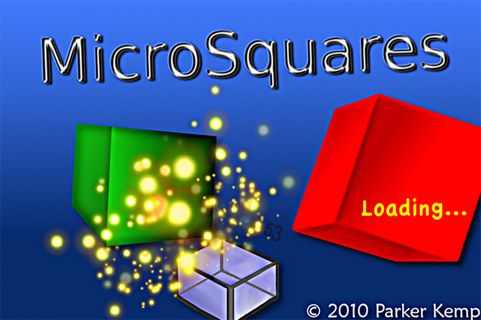 Microsquares is lacking serious ‘polish’ and in need of personality. The character idea is good, and not only for the center square but the others also. 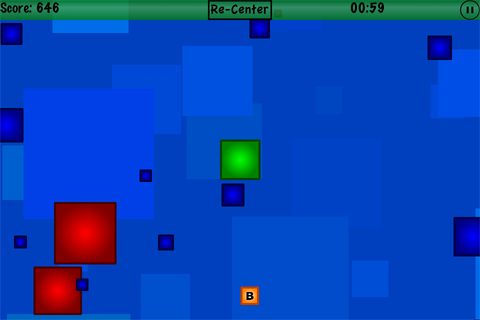 Currently, it seems like a prototype where all the moving squares are basic placeholders. All the menu screens are in serious need of love too. Is it made in Cocos2D? Good points all around. That font, though… it really has to go. 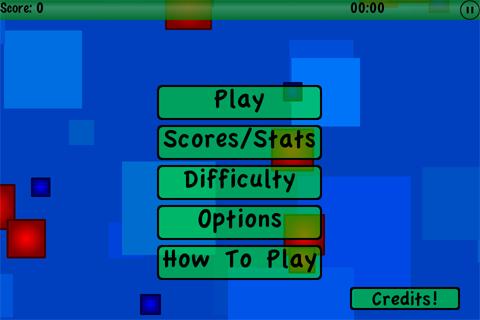 Even if making a kids themed game you need to stay away from anything even resembling Comic Sans. There are great comic style fonts you can use that have a much classier-yet-fun look to them. A piquing read. Critical reflection, especially when it’s not focused inwardly on your own project, is a valuable asset to gain some real perspective. Great post! It’s good to see some real feedback from a developer rather than just a reviewer. If this is going to be a regular thing I would love for you to do the same with our latest app Quimbers. I probably will do another one or two at some point, but I’m not sure how regular it’ll be. I’ll definitely check your app out though! Very interesting post. I should mention that the story of Trainyard is fascinating to read and you have good writing and story telling skills. That being said, one question comes to my mind when reading this post. This is about music. As you mentioned, it has to be attractive. Making good music is or isn’t in our own skills. But considering it is. What process, software do you use? I mean I found several software to generate small sounds effects that works pretty well like cfxr. But what I’m looking for is for background music. As you can imagine I’m not a musician, and I don’t have keyboard (musical one I mean) nor I can play it. I use Ableton Live for music, but that’s a whole different world. I agree with your comments. I do think that art directors and designers. Have a lot to say in this developer world. They can make the difference. Microsquares game can become ten diferents games ( In marketing terms) in depends on how you work on that. Create a funny characters nice tipos and a good desing. You can think in squares, fishes, mafia, or capitalists eating the small and beeing eaten by the biggest. Congrats for your trainyard ! And thanks for this blog! Hm, no mention of Osmos at all? This game could almost qualify as a de-make if a few more of the gravitational qualities were implemented. Yeah it’s definitely similar to Osmos, but Osmos wasn’t the first of this genre either. The early games in this style looked a lot more like MicroSquares, so it’s not as much a de-make as just staying true to the original style (or something like that, hah). I have played Osmos before, and it’s a great game. But there are a lot of eat-and-grow style games out there, and on that spectrum I would say Osmos and MicroSquares are in completely different regions in terms of the overall concept. Osmos is more physics-based and movement itself is part of a careful strategy. My goal with MicroSquares was to make a simple game with more emphasis on motor skills than thought processes; something I can get people to enjoy without overloading it with too many elements. “The more, the better” doesn’t always apply, in my opinion. A great example of concept vs. production quality is Minecraft, or “the game that surprised the world”. This game has horrendous graphics and physics by today’s standards, yet has sold half a million copies in its alpha version. Obviously I’m not making a direct comparison, but I think it’s a good example of why you should give every game a chance before passing judgment based on physics, or a “wow factor”. I would also suggest that after the remake Parker releases this as a new game under a new name. If he does most (or even half) of the things you suggest it will certainly be completely different than MicroSquares and deserving of a life of its own. It’s great to read your thoughts on how it could be a better game and look better — I think so many good/decent/great games in the app store (and in general, I guess) get overlooked because they have a poorly designed icon or “programmer art” — they may be great games, but people like to play stuff with a lot of polish. The last little bit of polish can often make the difference between a “good” game and a really great one. I’ll buy MicroSquares and give it a shot because it sounds like fun, but while I might play it, I also might be reluctant to show it to someone else because their first reaction, unfortunately, is going to be regarding how it looks. I look forward to seeing the transformation of MicroSquares. Aw, it’s not that bad, is it? I have no problem with you sharing it with your friends; I’m in no way ashamed of how it looks right now, it just needs some drastic improvement in some areas (especially the icon and the font). The gameplay may need a little tweaking, but overall I’m pretty pleased with it. If you think your friends would enjoy the concept of it, then feel free to share it as-is, if you want to. No, it’s not really that bad, though it does have that “here’s yet another flash game of some type” vibe to it, particularly because of the gradients. That said, though, I’ve seen really good games passed over and do really bad because they had a poor icon (and bad marketing, but that’s another story entirely). It *shouldn’t* matter to people, but it seems to. I would show it to the people that I know play a lot of games and don’t mind graphics in a heartbeat, but it’s not what I’d pull up to show someone if I wanted to show them “games on the iPhone”. Sorry that I didn’t clarify. All that said, you should be very proud of what you made and not be ashamed at all. We’re all in this together, and we’re all learning as we go. I’d hate to see people not play your game because of the way it looks, but I think that many people are really quick to pass over something that doesn’t look snazzy at first glance just because there are SO many options to choose from. Excellent post as usual. It’s always good to get a second pair of eyes on your project, especially one that provides constructive criticism as opposed to just a standard review that would throw your hard work under the bus. Matt, I think one important aspect is missing (or at least I could not find it). I think he needs a website for this game (or his company). I think it’s very important to to have a place where interested parties can keep up with the latest information you provide, join a newsletter, etc. The simple AppStore page Apple provides is not enough to build a long term customers of future games or versions of this particular page. It is also a place that reviewers, blogs, and news folk can find you easily and contact you in case they are interested in covering you and/or your game(s). Plus, I’m sure TrainYard gets at least a few sales from readers who found/follow this blog…it’s just one more point of contact to potential customers. Great point! A website doesn’t have to be complicated either, a single page will do. Just include the YouTube video, some basic game info, a link to buy the game and a contact email address. Nice blog – it’s interesting to hear proper feedback on a game. I reckon you hit the nail on the head regarding the Comic Sans font. Also, I think as a design rule of thumb, less is more. Look at the simplicity of Apple adverts or the (early) Facebook. The simplicity is appealing. There’s so much clutter and attention grabbing stimuli in our day to day lives, something simple, clean and neat sticks out. Or for that matter remember how everyone switched to Google search because it only had a logo and a search box in the beginning. Before then we were using Yahoo and Geocities. Count me on for next apps critiques, my very first game isn’t on the appstore yet so it has a lot of good stuff to point out. Mostly on user interface, game simplicity and most important let the users know what they need to know without telling them what to do to achieve it, no instructions, not too much clues, just a clear interface. I lack a lot of that.